Always delicious! Deep fried cauliflower…eggplant parmesan…salad & rolls! Good ambiance and service! I think the waitress are very friendly and polite. For my first time of being there I had stuff shell’s and it was very delicious. I will be eating there more often. Food and service was good. Nice atmosphere and friendly staff. Best manicotti I have ever had. In town for business will probably be back before I leave. I was very excited when I found out that you have more of a gluten-free menu now I want to thank you for that the gluten free pizza is really good !! And I just want to say that I have had Celiac Disease now for 25 years now and little by little it’s getting easier to eat out so thank you!! Awesome food and wonderful service!!! The salad and pizza were wonderful, bread was good as always and the wine was great! A great eating experience. Copious dining room. Could facilitate a roller rink. Excellent service..Hot cross rolls from the oven re supplied Yes, 5 star. Thanks,Vince. Hands down the best Pizzeria in Southeast Michigan. I remember coming to Pia’s for as long as I can remember!!! My parents took me here my entire life growing up. I know my father before me was coming here as well his entire family – as they lived and grew up in Taylor as well. I always remember the atmosphere – just a touch of romantic, very Italian feeling, but very soft and subtle lighting. Then that PIZZA!! I remember the cheese just stringing from the whole pizza and my slice as I grabbed it from the platter to my plate!! I never remembered any other pizza being so real and stringy – it was delicious and it told me the cheese and the ingredients were very much real and authentic. Then lastly – I remember – usually as we went out to pay (or carry out) – The sign from one room to another… It read something along the lines of “Watcha You Step!” Even though it may sound a bit stereotypical – It was so very funny!! I remembered my mother laughing about it every time we saw it… I believe that sign is long gone physically – but it will always be in my memories of Pia’s past. My extended family still comes to Pia’s from time-to-time. Now, with me living out-of-state, I don’t get there so often. When I an opportunity comes up – and I want that wonderful Pizza from my youth – I will stop in and relive it all again!! Thank you!! Pia’s food and staff are VERY good and all done professionally. Always great service to compliment our delicious food! They even double checked and asked politely if a booth was ok for my pregnant girlfriend. 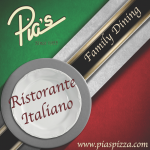 If you want GREAT authentic Italian food as well as WONDERFUL service and a nice atmosphere, come to Pia’s!!! Great Staff, Place & Food – Highly recommend! Great pizza, lots of room. Deliciously rich, authentic Italian flavor! Great pizza. Nice clean restaurant. My family and I gather here once or twice a year when my Grammy flies up to Michigan from Florida in the summer. Pia’s has been our dinner hang out for many, many, many years for these special gatherings. I have fond memories here! Wonderful staff for the most part. The user left just a rating. One of the greats. Authentic Italian food. My daughter and I went to Pia’s for lunch and I have to say that our waitress (I believe her name was Candice) was AMAZING!!! So friendly, upbeat, and just personal. There are so many grabby, unfriendly, and unhappy people in this world and to have such a nice and friendly person wait on us was so nice. She made our lunch very enjoyable! She really enjoyed her job and even talked very highly of how much she liked the owner of Pia’s. If only there was more people like Candice in the world it would be a much happier place! They created a drink just for me!After trying to pick something, they created something based on my preferences: sweet, fruity and colorful 🙂 = Awesomely Delicious! Just had a celebration of life gathering here and the staff and food were amazing! The staff was very attentive and so accommodating and the food was great. Would highly recommend!! North, East, South or West – PIA’S is the hands down BEST! I grew up downriver. When I was young going out for dinner was a rare treat. Having Pizza from Pia’s on a Friday night….a true delight! I’m now in my 60’s and live 200 miles away. I still crave Pia’s and when friends come to visit they are required to bring me a case of Pia’s Sauce! lol No, I don’t really MAKE them….but several know how much I still love this time-tested sauce and so they please me with this rare treat! WOW – Where do i start?? Love fresh food from the oven to your Table with a smile. Staff forever happy and seem to Love what they do, and always smiling. You would think they own the place. Sometimes I come in feeling a little low from life itself, But Always leave with a full belly and a sense of comfort, when I just left a bunch of happy people, who go out of their way, to serve with a smile. Thank you Pia‘s. I have to drive 45 minutes out of my way to go to Pia’s. BUT I was born just down the street from the restaurant 45 years ago and spent my childhood crunching long thin breadsticks as a toddler and this is still my Favorite Pizza Place in Michigan. My parents and I are always willing to make the 45 minute drive for some real Italian food! I wish I lived closer! Had a retirement party on wed. The food was really good and the waitresses did an excellent job at making sure everyone was taken care of. Thank you for having us! Your staff is warm, friendly and the service was great! The food was great too! Look forward to possible future events! Thank you for allowing Michigan Women 4 Women to host their First Ladies Night Out Shopping Event at Pia’s. The waitstaff were wonderful, they catered to our every need. Sam & Candice went above and beyond to serve us! We hope to host another Vendor event at Pia’s in the near future. Your food was excellent! Loved the Smothered Chicken! Yummy! Your cannolis were to die for. My family has dined there since the 1960’s, and Pia’s never disappoints! Thank you to PIA’s for allowing us to host our Ladies Night Out on June 2, 2015. It was a wonderful event. Your staff was top-notch and the room setup was great. As always, I enjoyed your food! Hopefully, we can do this again in the near future. ~Julie S.
I had the privilege of eating at Pia’s Tuesday evening and have to say that being Italian you always wonder how good the food is going to be. Well let me tell you that the stuffed shells were to die for! They were just like Mom used to make. Just like I make and I couldn’t get enough of them. The bread was warm and tasty and the service far exceeded my expectations. I highly recommend eating there and enjoying a great meal with friends and family. Thank you Pia’s for a fabulous dinner! !